Everybody loves a hot hatch, as the success of the Honda Civic Type R and Ford Focus RS show. Equally, buyers can’t get enough of SUVs, which explains the explosion of new models such as the SEAT Ateca and Volkswagen Tiguan. So why not combine the two? Perhaps take an Audi RS3 hatchback and mix it up with the Q3 small SUV. Despite a recent facelift, the Q3 lacks the ultra modern styling of its bigger Q7 sibling, but there’s a certain kerbside presence that belies its age and size. It’s sharper than its rivals, with bold lines and creases, but it’s also smaller than you might think – the gently sloping rear hatch stands out from the boxy SUVs crowd, but sacrifices outright space and ends up being closer to a so-called crossover. It’s none the worse for that, offering a more subtle take on a niche that is getting increasingly crowded. Of course, using the word ‘subtle’ when talking about an Audi with an RS badge is somewhat inaccurate; there’s a number of gaping air intakes at the front, a matt titanium extension to the grille that merges with the sleek headlights, the suspension has been lowered, while a spoiler mounted at the top of the tailgate and bigger wheels hints at the performance available. The hints continue inside, with heavily sculpted seats that hug you tight as you guide the RS Q3 with its flat-bottomed steering wheel. Traditional dials sit behind the wheel, which is something of a disappointment after Audi’s excellent Virtual Cockpit, an entirely digital display, has been shoehorned into the A3, A4, TT, R8 and others. However, Audi’s interior designers are years ahead fo the competition so the Q3 is still a match for any of its contemporaries. That’s not to say it’s without fault. The climate controls are difficult to use thanks to their location low down in the cabin, while a lack of tactile feedback means you can’t even use them by touch alone, meaning you’ll need to glance away from the road to see what you’re doing. The infotainment screen that pops from the top of the dashboard looks a little like an afterthought too, although there’s no doubting any of the quality. There’s plenty of space up front for passengers, but things get tighter in the rear. Go all the way back and the boot promises to accommodate 356 litres of your luggage, but it feels smaller than that due to a high floor and that sloping tailgate. However, the RS Q3 isn’t a car that’s about practicality, despite its SUV pretensions. What really matters is what’s powering the car, and that’s a soulful 2.5-litre five-cylinder turbocharged unit that punches out an impressive 335bhp. That translates to a sub-five-second 0-62mph time, pitching it against serious supercars, before going on to 155mph. The raw numbers don’t get across the whole package though. They miss out the wonderfully intoxicating noise the five-cylinder engine makes, the noise that urges you to push harder and use more of its power. That extra cylinder provides more torque lower down the rev range, so you’re rarely left without some reserve to propel you forwards, while the Quattro four-wheel-drive system keeps all that power going to the road. It’s all a bit manic, yet strangely controllable. 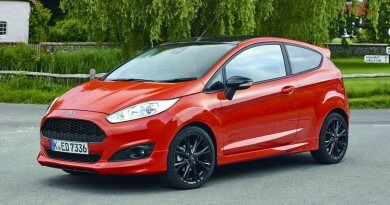 The seven-speed automatic gearbox, with obligatory flappy paddles, changes gear quickly and smoothly. Switch the Drive Select system to Sport and the box gets quicker, the throttle gets snappier and the steering gains weight, making it a blast to hurl around B-roads. Choose comfort and it relaxes a little, making it a comfortable car to cruise in. Comfortable doesn’t equate to being economical, though. The engine is pretty old-fashioned and hasn’t had the same eco-friendly work done to it that the latest small capacity three- and four-cylinder units have. That means that an average of 18mpg was the shocking figure the on board computer displayed after a day’s driving. Granted, it wasn’t always gentle, but 30mpg would be tricky even on a an easy motorway run. CO2 emissions the wrong side of 200g/km also means car tax and BIK rates are a tad rich. 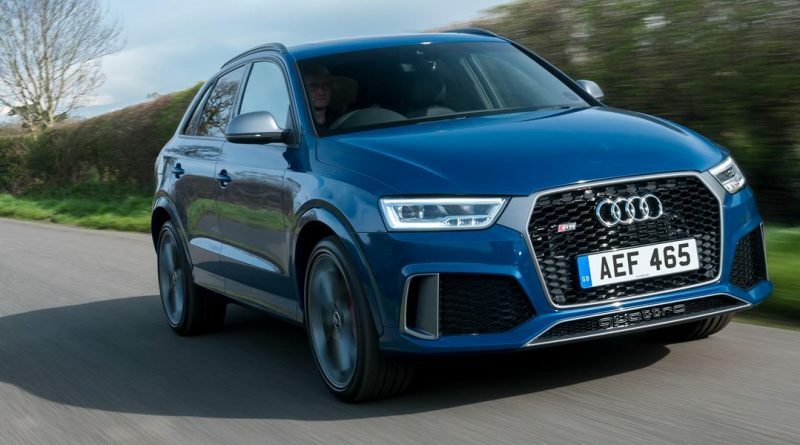 Despite all the arguments against it, the RS Q3 is a thoroughly capable SUV that entertains and pleases in virtually all circumstances, but there is a catch. The Q3, aged as it is, only offers a little extra practicality over the RS3. That shares the same sonorous five-cylinder engine, but actually offers a little more power with less weight, and that obviously translates to stronger performance. It’s cheaper too, as well as being more economical and costing less to tax. That makes the RS Q3 very difficult to recommend, which is a shame as it’s incredible.